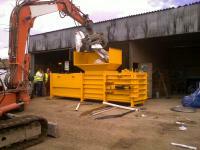 This horizontal baler is excellent for more brittle material and ideally lends itself to heavy duty baling. The CK600 horizontal baler is a three phase baler that produces 550–600 kg bales of cardboard. Why Choose This Horizontal Baler? To find out more about this horizontal baler, its features and the optional extras, please see the CK600 specification here, available either for download or printing.